Francisco Martínez Iglesias is a partner in the corporate law and M&A practice in the Madrid office. His areas of expertise include corporate law, mergers and acquisitions and private equity, both from the M&A side as well as fund structuring. He is a member of the Garrigues’ private equity multidisciplinary groups taking part in numerous seminars and industry analyses. He specialises in private equity, an area in which he has amassed extensive experience in the design and implementation of projects for the establishment of private equity and funds of funds vehicles, and also provides advice on numerous funds-based investment transactions, providing him with a comprehensive overview of the industry. 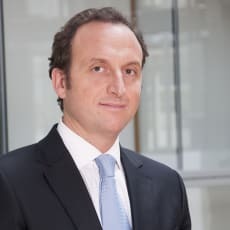 He has also been involved in a great number of M&A transactions and reorganisations in Spain across a range of industries (corporate, private equity and venture capital) and structures (buyouts with and without leverage, auction processes, sale and purchase of businesses, investment rounds, etc.). Francisco Martínez has a wealth of experience providing advice to companies, including on corporate reorganisations, and he serves as board secretary to numerous companies and multinational groups operating in various industries.